Please keep in mind that each criteria directly relates to the overall portfolio. As your business grows you will want a portfolio of True Solutions™ that a) builds intimacy with key executives above the safety line, and b) builds critical mass of the solution business, and pulls through product directly. The Proximity to What we Currently Do reflects the alignment to our current strategy. If a potential offer or Service Chain is very close to what we currently do – in terms of problems addressed in the market, segments served, etc. – then there is a logical buying connection between this offer and our portfolio. This linkage enhances our ability to sell (since we are already a known commodity in that space), and reinforces the firm’s strategic direction. 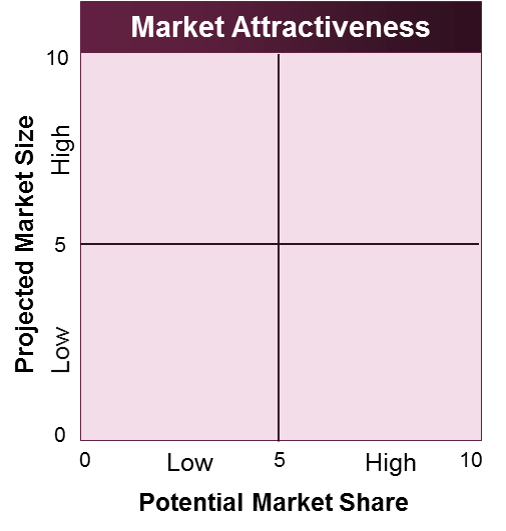 Differentiation Potential deals with the solution’s ability to create or build differentiation in a market. Evaluate whether or not this solution can either: 1) protect or cement your position in the market and accounts you already serve (i.e., fill a known gap); or 2) build differential for new/exisiting markets and accounts (i.e., create a gap). Finally, a prioritized solution should address a specific problem or opportunity that matters to a certain segment. It should be unique on its own, or should be a new Idea or “twist” on an exisiting Idea. 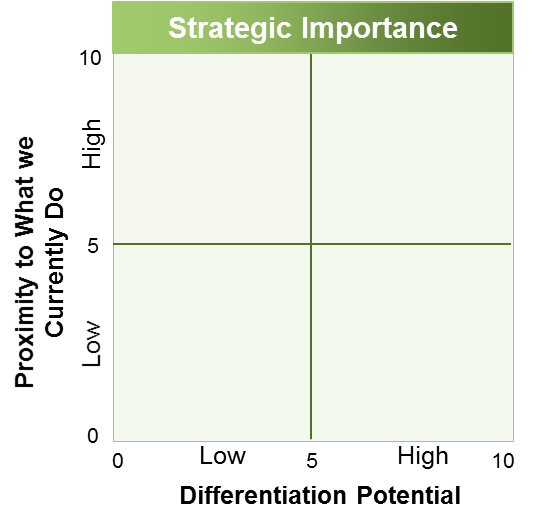 The two factors together provide indications of the strategic impact of the Idea and its related Service Chain. 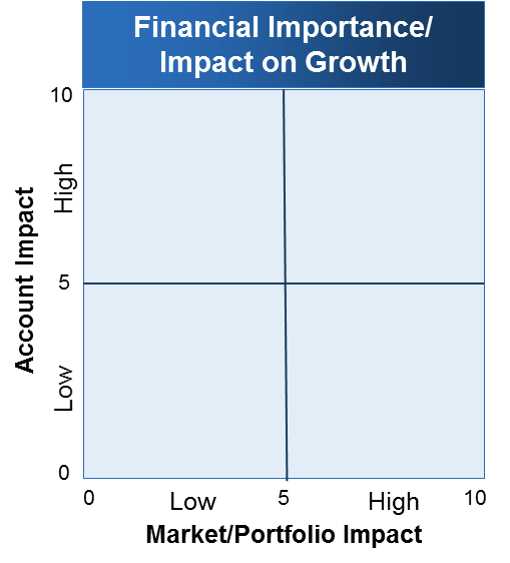 Account Impact (average revenue per account) deals with both the revenue driven by the service chain (or group of service chains in an umbrella idea). Again, “intimacy-only” solutions may rate low on this measure, but might have financial importance because of their influence on the solutions portfolio. Another consideration: does the idea drive large product deals? Is it driving significant revenue? Market/Portfolio Fit. This deals directly with the issue of rounding out your portfolio and assuring that you have customized, meaningful intimacy offers. Intimacy offers are often the most difficult to get our clients to create (especially meaningful ones) and embrace because they require deep vertical knowledge and often are far from their traditional business. This criteria should also drive interest in outsourcing offers which have long term contracts and force interest in direct product pull through offers. Projected Market Size deals with number of transactions that can be reasonably expected from the market, specifically – number of potential clients that could buy the offer. These projections should take into account where the market is in the absorption bell curve. Is the offer creating a market? early in market? in the middle of the market? or late to market? I have experienced many clients that want to bring offers to market late in the cycle. I’m not sure why this is so prevalent, but it should not be done. Typically, these types of companies are also the least comfortable bringing an offer to market early in the curve. Potential Market Share deals with the issue of the number of people that could buy the offer what percent will buy yours. It is best to be conservative about this calculation. One thing to keep in mind is that some markets are so large compared to the penetration needed for success that performing detail calculations of this are not necessary. One last thought: sometimes markets are relatively small – think aircraft components manufacturers, or telecom providers suppliers – for them, the value of the intimacy offers dominates the discussion of the idea. This criteria deals with your ability to get to market, get deals, and deliver the promise. Sales Capacity deals with number of resources that can perform idea-selling activities for the offer. This means they are trained and equipped to conduct idea and stakeholder meetings and perform the linkages throughout the service chain. This is no small feat. As we’ve discussed, Idea Selling is much more about advising the client rather than traditional selling. Delivery Capacity deals directly with number of trained resources available to deliver the dream and participate through the sales cycles. Many companies short-change this investment in the misconception that these people are a cost item not a revenue item. In summary, once you have scored an idea you can apply weighted averages of the different criteria – driven by the gaps in your portfolio. This provides the mechanism for making idea in/out decision.